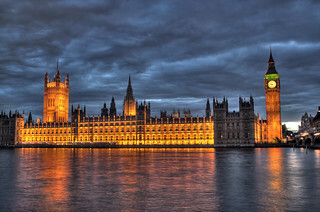 The Parliament of the United Kingdom of Great Britain and Northern Ireland is the supreme legislative body in the United Kingdom and British overseas territories. It alone has parliamentary sovereignty, conferring it ultimate power over all other political bodies in the UK and its territories. At its head is the Sovereign, Queen Elizabeth II. 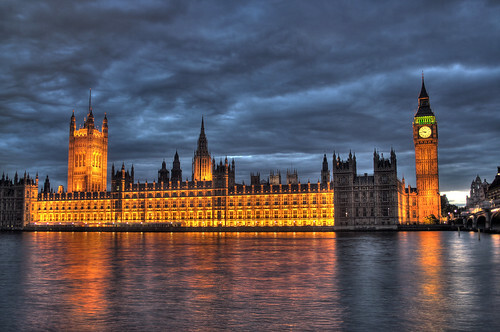 The parliament is bicameral, with an upper house, the House of Lords, and a lower house, the House of Commons. The Queen is the third component of Parliament. The House of Lords includes two different types of members: the Lords Spiritual (the senior bishops of the Church of England) and the Lords Temporal (members of the Peerage); its members are not elected by the population at large but are appointed by past or current governments. The House of Commons is a democratically elected chamber with elections to it held at least every 5 years. The two Houses meet in separate chambers in the Palace of Westminster (commonly known as the "Houses of Parliament"), in the City of Westminster in London. By constitutional convention, all government ministers, including the Prime Minister, are members of the House of Commons or, less often, the House of Lords, and are thereby accountable to the respective branches of the legislature. The first 'United Kingdom' Parliament was formed in 1707 to replace the parliaments of England and Scotland as a result of the Treaty of Union, though in practice the parliament was a continuation of the English parliament with the addition of Scottish MPs and peers. The Parliament of England had itself evolved from the early medieval councils that advised the sovereigns of England. England has been called "the mother of parliaments", its democratic institutions having set the standards for many democracies throughout the world, and the United Kingdom parliament is the largest Anglophone legislative body in the world. In theory, supreme legislative power is vested in the Queen-in-Parliament; in practice in modern times, real power is vested in the House of Commons; the Sovereign generally acts on the advice of the Prime Minister and the powers of the House of Lords are limited.